Welcome, June! We've had another busy month and have lots of updates to share with you. If you missed last month's update, see here. 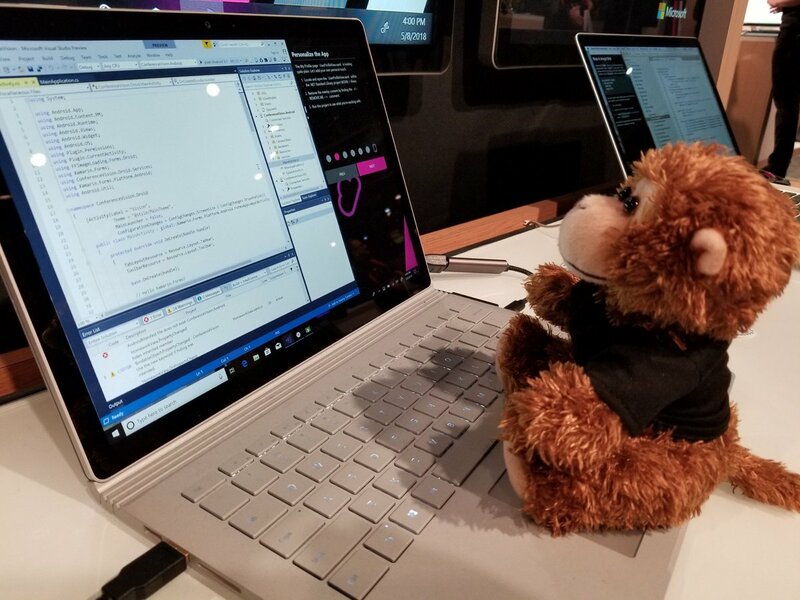 A few weeks ago, we attended Microsoft Build 2018 and had a great time meeting a lot of passionate technical enthusiasts. The Xamarin University team also delivered two workshops - both at maximum capacity! If you couldn’t attend or missed any of our conference workshops, learn at home by downloading the instructions and code. The first workshop teaches you how to build your first Xamarin.Forms app for the Android, iOS, and Windows platforms using C#, Visual Studio, and Xamarin.Forms. The second workshop shows you how to add Azure App Service Mobile Apps, a cloud-based backend to store your mobile app data, share it with other users. It also shows how to add support for Azure Speech to Text cognitive services, allowing your users to speak to add data. Making your app recognizable to users is an important part of establishing a brand. In our new course, Add a Launch Screen and App Icons [IOS104], learn to use icons and a launch screen to establish a consistent look, use an asset catalog to organize your icons and include them in your project, and design a storyboard launch screen and make it responsive so it works on all devices. Complete this course to learn how to have an app with eye-catching icon that looks great on the home screen and at startup. We're excited to welcome four amazing technical guest speakers to present in our Xamarin University Guest Lecture Series, live webinars on topics not available in our catalog. Upcoming Guest Lectures include James Montemagno on accessing native features from cross-platform code using Xamarin Essentials, Dan Siegel on accelerating mobile DevOps with Mobile-BuildTools, Jim Bennett on building cross-platform apps with immutable models and UI with less code using F# and Xamarin, and Laurent Bugnion on building serverless APIs for cross-platform apps with Azure Functions and Xamarin. Learn more. Xamarin.Forms 3.0 was released at Microsoft Build and we've got you covered with five new Lightning Lectures on this topic, covering WPF Support, Visual State Manager, Flex Layout, CSS, and Right-to-left Support. Learn now. As an extension of our Publishing an Android App [AND220] course, this lecture explains "Google Play App Signing," an enhancement to the app signing process. It allows app creators to store the signing certificates of their apps directly inside Google Play Console. One benefit of this feature is that it enables you to update your application in case you lose your original keystore file, which is otherwise impossible. Watch now. In this lecture, we'll look at the new Xamarin.iOS WeakAttribute which automated the process of wrapping a field as a WeakReference. This new attribute elegantly helps you reduce potential circular references in your Xamarin.iOS apps. Watch now. Add the Multitasker badge to your profile by completing these three courses: Using Async and Await [CSC350], Writing Multithreaded Mobile Applications [CSC351], Intro to Thread Safety and Synchronization [CSC352]. After achieving your badge, you can finish the series with More about Synchronization [CSC353]. Get started. If you take courses early in the morning, the Early Bird badge is for you. Complete any course (self-guided or instructor-led) between 4:00am-8:00am, your local time, to unlock the Early Bird badge. Get started. Lastly, unlock our Self-Guided Learner badge by completing any five self-guided learning courses to show off your dedication to being self-motivated. Get started.